Oh no! All the animals are under the threat of disappearance. And you must do something! Just try to save all the Safaris in the world and get a lot of money for that. Be sure that you can cope with it. Use all the tips and be sure that this game is the best way to spend some time. Do you like animals? Then you must save all the Safari in the world! 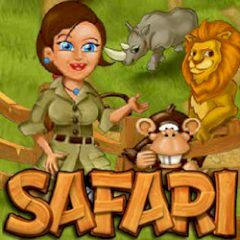 Start your missions from the USA and guide tourists through a beautiful safari park. On of your tasks will be to show your visitors monkeys, hippos, lions and many more wicked animals. Just try to use your management skills and save the Youda Safari Park at any rate! It is so easy! Just follow all the clues and make this world more and more beautiful. Everything depends on you, so try to save all the animals of parks and have fun!